Childhood obesity is a global public health problem related to many preventable diseases, alarmingly on the increase. Iran is no exception. In an effort to address this problem, we designed and tested an intervention to combat excess weight gain among primary-school-age children in Tehran, Iran. Based on potentially effective interventions, as reported in the literature, and the preferences of the key people involved (pupils, parents, and school staff) about an ideal intervention, as evidenced through a qualitative study, the components of the intervention were extracted: nutrition and physical activity education for the pupils, life style modification education for the parents, and improvement of schools’ canteens. This was followed by a meeting attended by a group of experts on childhood obesity to decide on the components of the intervention. The final intervention model was designed with due consideration of similar models proposed by the World Health Organization. Fig. 1. 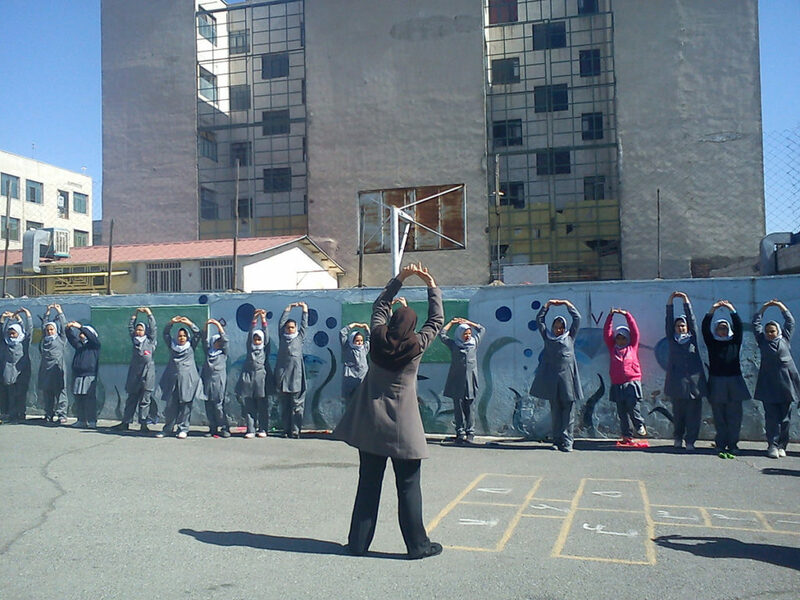 The figure shows the female students who are attending physical activity session in one of the intervention schools. The intervention was implemented in academic year 2012-2013 (about 18 weeks) in Tehransar, a low- to middle socio-economic district in Tehran. The participants were overweight and obese school girls and boys (4th to 6th grades), from 12 primary schools, 6 assigned to the intervention and 6 as the comparison group (that is, with no intervention). A total of 344 pupils, 167 in either group, who had informed consent of their guardians/parents, were included in the study. Weights, heights, waist and hip circumferences and triceps skinfold (which indicate the degree of overweight and obesity), food intake, as well as the physical activity of the pupils were compared before and after the intervention. Nutrition and physical activity education: The pupils attended one education session per week run by the health instructors of the schools, who initially received a training and were provided with a reference book as well as a guide for each session. The parents attended monthly education sessions run by the researchers, all experts in nutrition and healthy eating education. As regards physical activity, in addition to the regular weekly sport sessions, we planned an additional 2 one-hour sessions a week for physical activity education of the pupils, run by schools’ coaches. Schools’ canteens: What food items are offered in the schools’ canteens will affect the pupils’ food choice. If the right food items, prepared appropriately, are offered, the pupils will unconsciously learn what foods are good for them. The canteen-keepers were recommended to stop selling high-energy food items and reduce the amount of oil in the food they offered; use better food preparation/cooking methods; and serve whole-wheat bread or pasta, legumes and more vegetables. The intervention brought about reductions in the body mass index and hip circumference of the pupils, although it did not affect the length of time spent on TV viewing. Waist circumference increased in both groups, but the increase was higher in the comparison group. However, the pupils had increased their daily vigorous physical activity. Their food intake increased, which might have been expected, because they were more active now. Neither triceps skinfold thickness nor the time spent on the computer changed in the intervention group, while they increased in the comparison group, who had not received education. This study provides a successful model for designing and implementation of interventions aiming at decreasing excess body weight in pupils and, thus, reducing their risk of obesity. A School-Based Intervention to Reduce Excess Weight in Overweight and Obese Primary School Students.